EVO Portland has lots of space for young, energetic climbers to get started climbing, a great way for kids to expel energy and explore on structures that encourage climbing movement with little to no experience. The kid’s area is the perfect option if you want to bring your tiny humans in with little-to-no-notice, and would rather learn to belay at a later date, if at all. We ask that parents are responsible for directly supervising their kids while they climb in these areas. The Kids’ Fort spans from the lower floor up to the second floor boasting views 40’ above the main floor. 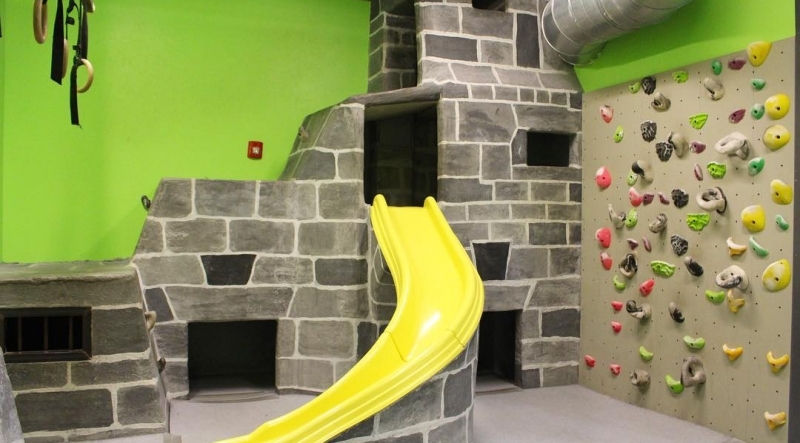 The Fort features kid specific bouldering, a “castle” style climbing area (complete with “dungeon”), a slide, rings, hidden tunnels, and a plexiglass wall that allows the experience of climbing in a controlled environment while still being visually connected to the larger space. The perfect area for kids to exercise and explore their climbing skills (under parental supervision, of course)! In our Gibbons program your tots will develop strength, coordination, and social skills as they spend time on the wall learning the basics of climbing as well as playing group games. Instructors create a comfortable and secure atmosphere for your child, parents are welcome! Geckos are engaged socially and physically through roped climbing and a variety of fun climbing related games and activities to help teach basic technique and movement. Focusing on top rope and problem-solving skills, Geckos is a great way to introduce your child to climbing in a fun and inclusive environment. Goats focuses on skill-building and climbing essentials both on top rope and in our bouldering area. 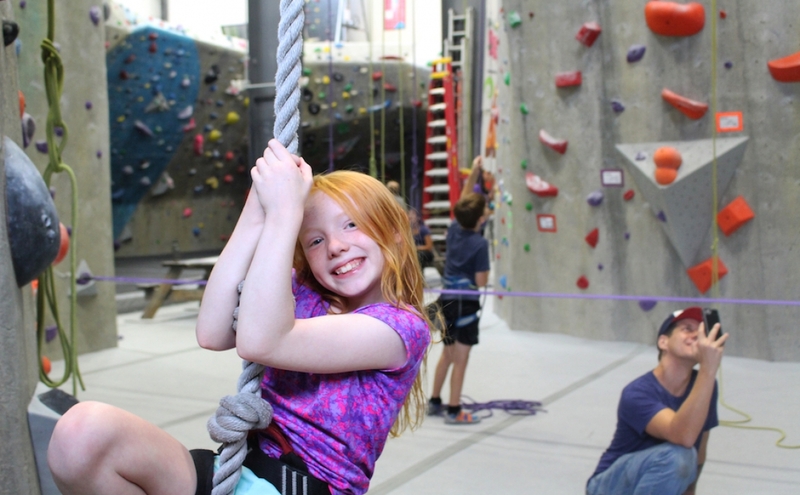 This non-competitive program will emphasize transitioning your child into more advanced skill sets such a belaying, rope handling, and more advanced climbing technique. Goats exercise responsibility and focus through belaying while having fun, increasing strength and ability, and learning more about the sport as a whole. We believe that creating an interactive class based on real-life skills is key for this age group! 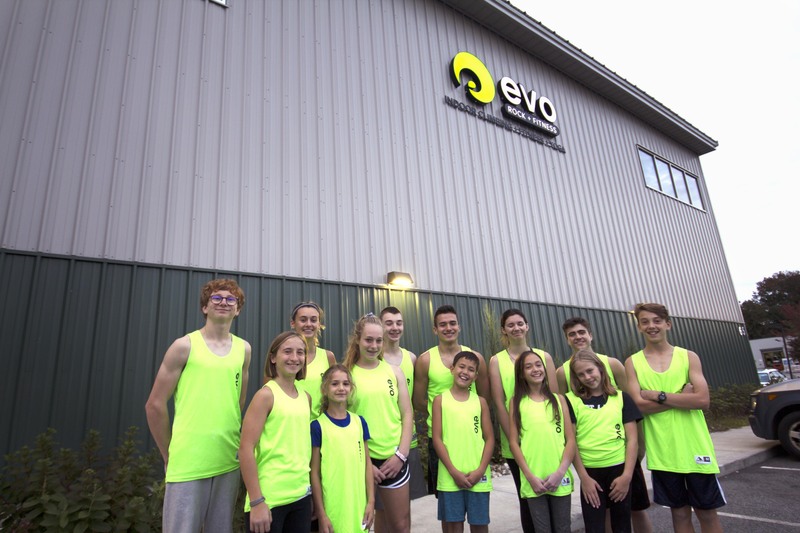 Team EVO is our intensive training program for athletes aged 7-19 who want to be serious in pushing themselves to their limits and beyond. Competing in USA Climbing competitions is a key aspect of this program as well as specialized training for competitions. Practices include conditioning, flexibility, strength training and mental focus. Climbers wishing to join Team must have prior climbing experience or receive a recommendation from a coach. For more information contact Chuck Curry. Interested in starting an EVO team at your High School? EVO School League is a program for high schoolers to join their friends for a different type of sport experience (as opposed to soccer or football). School League memberships come with all of the perks of a normal membership, but are at a discounted prepaid price. Contact us to get your school signed up. All members will need to fill out a School League Member Form and submit it to the gym. These will be available through your schools’ selected team captains and faculty advisers. Days will be loaded with top-rope climbing, bouldering, games, slacklining, and adventure. Hanging out and exploring our 40′ walls will offer every participant a fun time to remember, and an urge to come back. Kids will experience the greatest climbing areas Maine and New Hampshire has to offer. The week will consist of one indoor training day and three days of outdoor climbing. Age: Age groups vary and will be evaluated on a case by case basis to see if they are eligible to participate in outdoor camp. **We must have 3 participants to run the outdoor camp. If we don’t have enough sign-up within 3 days of the camp we will cancel. For more information contact Chris Pert. Kids’ Fun Days are designed around school holiday breaks to provide a great activity for kids. They’ll be totally psyched reaching the top of our 40′ walls, playing games and learning new skills. Kids enjoy the physical benefits of climbing, while getting plenty of social interaction.